The Farr Out Family: Here's to you Mrs. Farr! Here's to you Mrs. Farr! 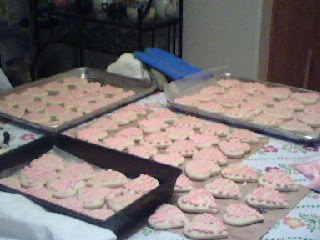 On behalf of Lori's Junior High students I want to thank her for making all of the Valentines Day cookies that she did. 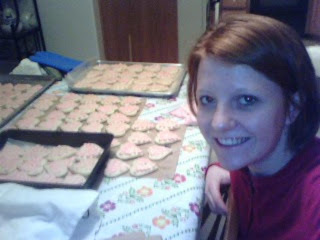 She has roughly 200 students and decided to make Valentines Day cookies for all of them. So until about 10pm last night and starting at 5:30am today our house has been a bakery. I know it looks like Lori has a black eye, it is just the lighting and the fact that this picture was taken at around 6am today. Yummy! We love Valentine Cookies! How fun....lucky Jr. High kids! Good Job Lori! Holy Hannah, Girl!! That's a lot of cookies! Your students are so lucky! Lori, you are going to make a wonderful teacher. But better yet, you are going to make the best Mom!